Starting a business has its fair share of ebbs and flows – it can be extremely challenging to get a new business off the blocks, and extremely rewarding when everything goes according to plan and yields desired results. For startups, it is important to get the nuances of running a business right from day one. To succeed in an immensely competitive space, startups need to perform above and beyond expectation right from the start, and one of the factors that can be of great help during the growing years of a startup is web data extraction. 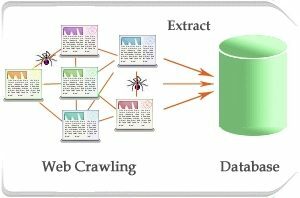 Web data extraction through crawling and scraping, a highly efficient information gathering process, can be used in many creative ways to bring about major change in the performance graph of a startup. With effective web data extraction services acquired by outsourcing to a reputed company, the business intelligence gathered and the numerous possibilities associated with it, web crawling and extraction services can indeed become the difference maker for a startup, propelling it to the heights of success. What drives the success of web data extraction? When it comes to figuring out the perfect, balanced web data collection methodology for startups, there are a lot of crucial factors that come into play. Some of these are associated with the technical aspects of data collection, the approach used, the time invested, and the tools involved. Others have more to do with the processing and analysis of collected information and its judicious use in formulating strategies to take things forward. With the advent of highly professional web data extraction services providers, massive amounts of structured, relevant data can be gathered and stored in real time, and in time, productively used to further the business interests of a startup. As a new business owner, it is important to have a high-level knowledge of the modern and highly functional web scraping tools available for use. This will help to utilize the prowess of competent data extraction services. This in turn can assist both in the immediate and long-term revenue generation context. From the very beginning, the dynamics of startups is different from that of older, well-established businesses. The time taken by the new business entity in proving its capabilities and market position needs to be used completely and effectively. Every day of growth and learning needs to add up to make a substantial difference. In this period, every plan and strategy, every execution effort, and every move needs to be properly thought out. In such a trying situation where there is little margin for error, it pays to have accurate, reliable, relevant and actionable business intelligence. This can put you in firm control of things by allowing you to make informed business decisions and formulate targeted, relevant and growth oriented business strategies. With powerful web crawling, the volume of data gathered is varied, accurate and relevant. This data can then be studied minutely, analyzed in detail and arranged into meaningful clusters. With this weapon in your arsenal, you can take your startup a long way with smart decisions and clever implementations. Web data extraction is a task best handled by professionals who have had rich experience in the field. Often, in-house web scraping teams are difficult to assemble and not economically viable to maintain, especially for startups. For a better solution, you can outsource your web scraping needs to a reliable web data extraction service for data collection. This way, you can get all the relevant intelligence you need without overstraining your workforce or having to employ additional personnel to handle web scraping. The company you outsource your work to can easily scrape data from multiple sources as per your requirements, and furnish you with actionable business intelligence that can help you take a lead in a competitive market. One of the most important business processes for a startup is competition analysis. This is one area where web data extraction can come across as an invaluable enabler. In the past, many startups have effectively used web scraping to fish for backlinks and social rankings related to competing companies. Backlinks are important to reach a greater mass of better-targeted audiences, which can go on to increase customer base with minimal efforts. Social ranking is also an immensely important factor, as social actions on the internet are building blocks of opinion and reputation generation in this day and age. Keeping this in mind, you can use web data extraction to scrape for social rankings and backlinks related to content generated by your competing companies. After careful analysis, it is possible to arrive at concrete conclusions regarding what your competitors are doing well, and what sells the best. This information is gold for marketers and sales personnel, and can be used to discern exactly what needs to be done to increase social buzz, generate favorable opinion, and win over customers from your competitors. You can also use this technique to develop high authority backlinks that help with SEO, targeted reach and organic traffic for your business website. For competition analysis, web scraping is a formidable tool. Another important aspect of business that startups can never ignore is good networking. Whether it is with customers, prospective customers, industry peers, partners, or competitors, excellent networking and open, transparent communication is essential for the success of your startup. For effective communication and networking, you need a large, solid list of contact information pertaining to your exact requirements. Scraping data from multiple web sources gives you the perfect method of achieving this. With automated, fast web scraping, you can in a short time collect a wealth of important contact information that can be leveraged in many different ways. Whether it is the formation of lasting business relationships or making potential customers aware of what you have on offer, this information has the power to propel your startup to new levels of recognition. If you sell your products and services online and want to stay on top of the competition when it comes to variety, pricing analysis, and special deals and offers, web scraping is the way to go. For many e-commerce startups, the problem of high CTR and low conversion is a stumbling block to higher bottom lines. To remedy problems like these and to ensure better sales, it is always a good idea to have a clear insight about your competition. With web data extraction, you can be always aware of what competing companies are doing in terms of pricing strategies, product diversity and special customer offers. By considering that information while evaluating and cementing your own strategies, you can always ensure that you provide better value and range of products and services than your competitors, and therefore stay ahead of the competition. For startups, the first wave of promotion and marketing is the one that holds the key to your long-term business success. It is during this phase that the first and most important public perception of your company is formed, and the rudiments of public opinion start taking shape. For this reason, it is crucial to be on point with your marketing and promotion during the early, formative years of your business. To achieve this, you need a clear, in-depth understanding of your target audience. You need to categorize your target audience on the basis of many factors like age, gender, demographics, income groups and tastes and preferences. Such detailed understanding can only be possible when you have a large wealth of social data pertaining to your target audience. There is no better way of achieving this than by web data extraction. With the help of data extraction services, you can gather large chunks of relevant data regarding your target audience which can help you accurately evaluate the potential of each prospective customers as a possible addition to your business family. To ensure that you have a steady, early wave of customers to take your business off the blocks at a rapid pace, you need to devise marketing campaigns, promotional strategies and advertisements in accordance with the customer knowledge you drive through your web scraping efforts. This is a foolproof strategy to have marketing and promotional plans in place that achieve goals, bring in new business and provide your company with enough initial momentum to carry it through the later years of success. To conclude, web data extraction can be a veritable tool in the hands of a startup. With the proper use and leveraging of this technique, your startup can gather the required business intelligence to shine in a competitive market and become a favorite with the customer base. Working with the right web data extraction company can be one of the most important business decisions you make as a startup owner.